Western blot analysis of extracts from HeLa cells, transfected with 100 nM SignalSilence® Control siRNA (Unconjugated) #6568 (-) or SignalSilence® CK2α siRNA I (+), using CK2α Antibody #2656 and α-Tubulin (11H10) Rabbit mAb #2125. 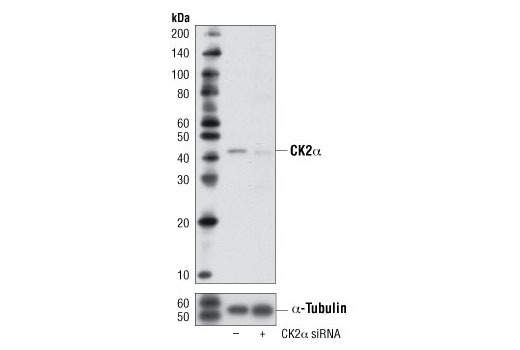 The CK2α Antibody confirms silencing of CK2α expression, while the α-Tubulin (11H10) Rabbit mAb is used as a loading control. CST recommends transfection with 100 nM CK2α siRNA I 48 to 72 hours prior to cell lysis. For transfection procedure, follow protocol provided by the transfection reagent manufacturer. Please feel free to contact CST with any questions on use. SignalSilence® CK2α siRNA I from Cell Signaling Technology (CST) allows the researcher to specifically inhibit CK2α expression using RNA interference, a method whereby gene expression can be selectively silenced through the delivery of double stranded RNA molecules into the cell. All SignalSilence® siRNA products from CST are rigorously tested in-house and have been shown to reduce target protein expression by western analysis. CK2 (formerly called Casein Kinase II) is a highly conserved protein kinase with more than 300 substrates regulating cell growth, cell death, and cell survival. CK2 has been implicated in the response to UV irradiation-induced DNA damage, targeting XRCC1 (1) and BRCA1 (2) as well as regulating p53 tumor suppressor protein functions (3). Furthermore, CK2 plays a key role in NF-κB activation (4). UV irradiation stimulates CK2-mediated phosphorylation of several carboxy-terminal residues within IκBα, resulting in IκBα proteasomal degradation and the release and nuclear translocation of active NF-κB. CK2 is also dysregulated in many cancers (5) and neurodegenerative diseases such as Alzheimer's and Parkinson's diseases (6). Structurally, CK2 is a multimeric protein complex consisting of two catalytic subunits (α or α') and two regulatory β subunits (7). CK2 is distributed ubiquitously and is apparently constitutively active (7). While cell cycle-dependent Ser-Pro phosphorylation sites have been identified on CK2α and CK2β, Tyr255 phosphorylation by the Src-related kinase c-Fgr seems to have the greatest effect on CK2α activity (8,9). Morales, J.C. and Carpenter, P.B. (2004) Sci Aging Knowledge Environ 2004, pe24. O'Brien, K.A. et al. (1999) Biochem Biophys Res Commun 260, 658-64. Cox, M.L. and Meek, D.W. (2010) Cell Signal 22, 564-71. Dominguez, I. et al. (2009) Cell Mol Life Sci 66, 1850-7. Trembley, J.H. et al. Biofactors 36, 187-95. Perez, D.I. et al. (2011) Med Res Rev 31, 924-54. Bosc, D.G. et al. (1995) J Biol Chem 270, 25872-8. Donella-Deana, A. et al. (2003) Biochem J 372, 841-9. Litchfield, D.W. (2003) Biochem J 369, 1-15.